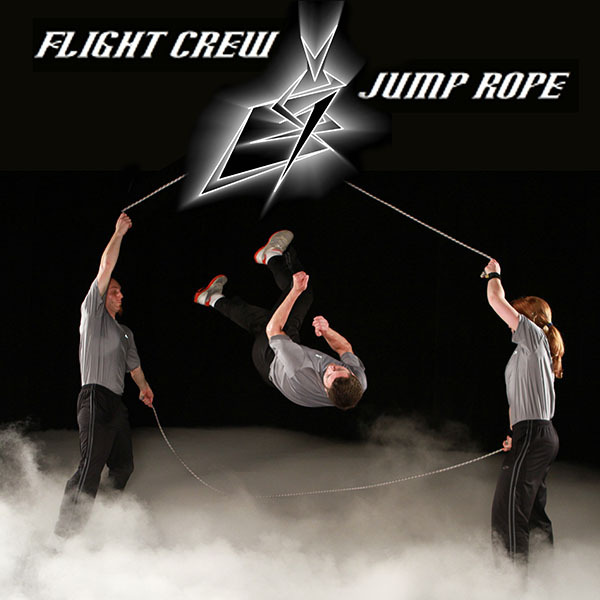 FLIGHT CREW JUMP ROPE | Love Productions Inc.
Lee Reisig started jumping rope at the age of 8 in Bozeman, MT when his mother decided to start her own team-The Rocky Mountain Ropers- after seeing a performance by a touring team from Idaho. Although reluctant at first, Lee finally attended his first practice and was hooked immediately. Lee continued to jump all the way through high school making quite a name for himself on the national stage. After graduation, Lee was asked by his friends on the Summerwind Skippers to join their team for the FISAC World Championships in Australia the following summer. After a long year of commuting back-and-forth between Montana and Idaho, Lee decided to move permanently to Boise, ID to be a Summerwind Skipper full-time. Throughout college, Lee continued to jump earning several National and World titles, a spot on the US All-Star team, and even appear in a documentary film titled “JUMP!” He even managed to find time to create a jump rope language. After college with degree in hand, Lee was still not ready to face the ” real world,” so he began auditioning for performance companies. In spring of 2009, he got his first performing gig with Cirque le Masque. A month later another with Cirque du Soleil, and in the winter a 2 month tour with Cirque Dreams “Holidaze.” Since then Flight Crew Jump Rope has worked extensively with Cirque Dreams appearing in several tours including the “Jungle Fantasy” world tour. Shortly after his first “Holidaze,” Lee was asked to be a part of the jump rope group Saltare, which was to appear on the fifth season of MTV’s “America’s Best Dance Crew.” Saltare managed to place in the top 5 and are still performing together today. The following summer Lee was a part of another reality TV show, when “America’s Got Talent” asked the Summerwind Skippers to appear on their show. Lee and another five members of the team were on TVs across America for 5 amazing performances before they were eventually cut from the show as Semi-finalists. Since then, Lee has been touring with Cirque Dreams and performing with both Saltare and Summerwind Skippers in various places around the world. Lee decided to form Flight Crew Jump Rope in an effort to give older jumpers the opportunity to jump rope professionally by performong and teaching, and also to share his love of jump rope with the world by providing the best jump rope supplies available. He believes that jump rope is a not only a great activity for staying in shape, but a way to find happiness in life through hard work, dedication, team work, trust, and creativity.